Any horses listed here as "roan" are not classic dark-headed roan, but exhibit the roaning sometimes associated with sabino. This color is sometimes called "gray" in the real horse world, but true gray does not currently exist in the Clydesdale gene pool. 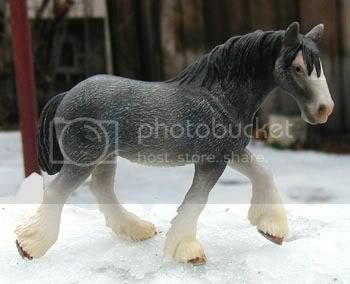 Model information: Stone Horses Trotting Draft mold, Woody Clydesdale, limited run, glossy version. Lines to Broadlea Classic Joe, Soloman's Commander. Grandsire on dam's side is NAN qualified. 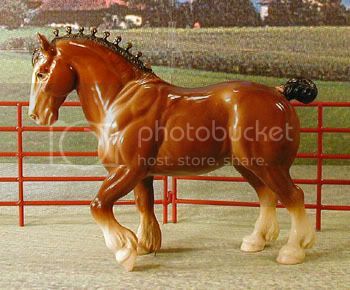 Model information: Breyer Clydesdale stallion mold; #3170 Circus Extravaganza Set, produced 1994-1995. 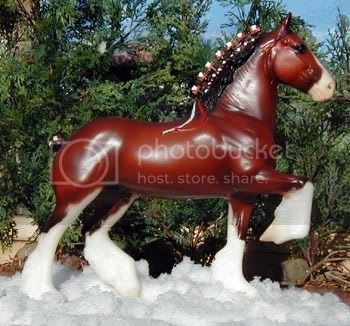 Model information: Hagen-Renaker mini Clydesdale; production dates unknown/discontinued. Lines to Armageddon's Lord Jacob, Doura Masterstroke, Bardrill Glenord, Doura Aristocrat, Doura Excelsior, Bardrill Castle. Sire has a live show reserve championship. 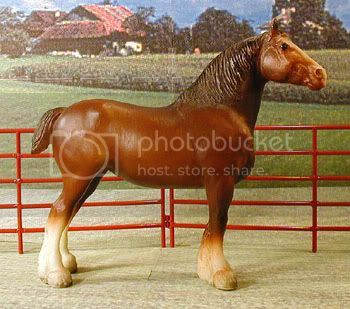 Model information: Breyer Clydesdale Stallion mold; #80 Clydesdale produced 1958-1989, with many variations and changes made over time. This particular model is called "version C" in Nancy Young's Breyer Molds and Models: Horses, Riders, and Animals and was produced 1963-1969/71. Lines to Dunelm Tartan; sire has multiple NAN qualifications, and was a NAN heat finalist. 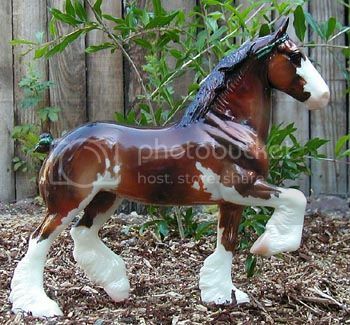 Model information: Breyer Stablemate scale G2 Drafter, Horses of the World set, special run sold through TJ Maxx stores in 2004. Lines to Doura Masterstroke, Doura Excelsior. Awards: Many past NAN qualifications, live show draft breed champs/reserves, heat finalist at NAN 2004, and has achieved Champion status with IMEHA. 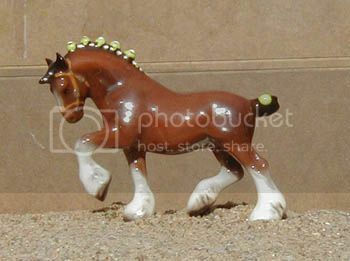 Model information: Stone Horses Trotting Draft mold; #9741 Andy, produced 1999-2000. Lines to Teddy Footprint, Craigie Surmount, Glenburnie Scot, Billsons Hedgewood King. Dam is a champion halter horse. 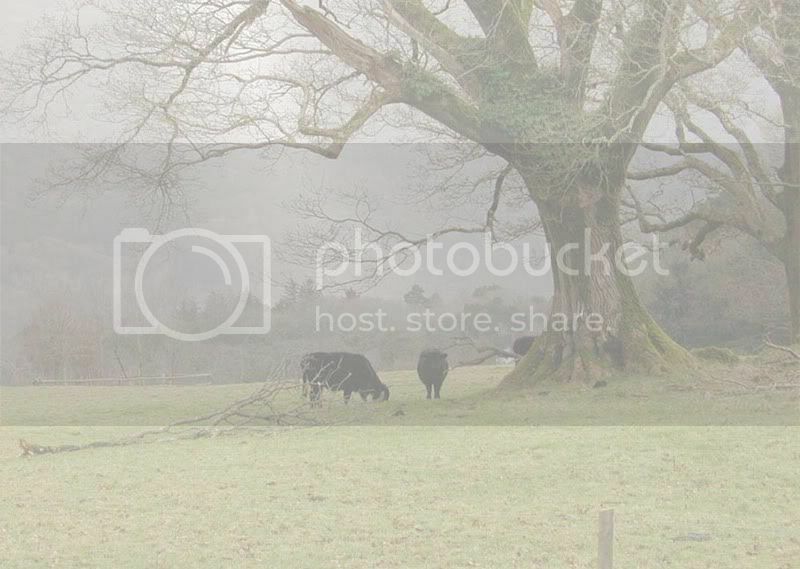 Awards: Photo show placed, past NAN qualifications, heat finalist at NAN 2004. 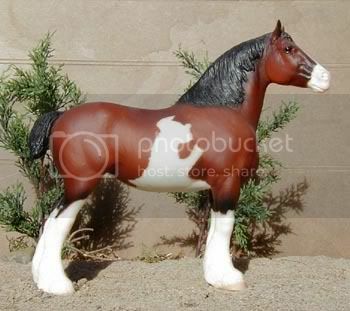 Model information: Stone Horses Trotting Draft mold; Blood Bay Clydesdale. Awards: Live show placed in collectibility. 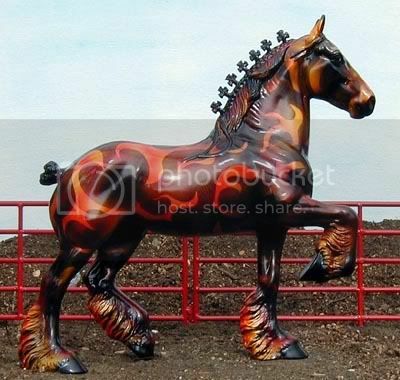 Model information: Stone Horses Trotting Draft mold; Inferno; special run. Model information: Breyer Clydesdale Mare mold; #83 Clydesdale Mare, produced 1969-1989. Lines to Doura Gael Force, Soloman's Commander. Sire is NAN qualified. 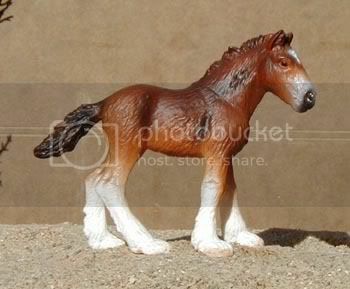 Model information: Schleich Clydesdale Mare; produced 2005(?)-current. Awards: Has achieved Superior Champion status with IMEHA, including two division Reserve Championships. 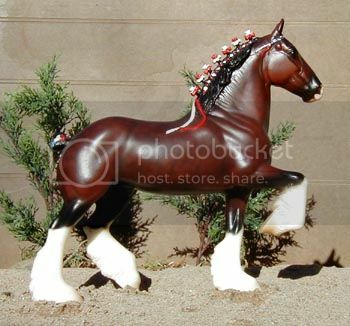 Model information: Breyer Clydesdale Mare mold; #775 "Northumberland Flowergirl", produced 1999-2003. 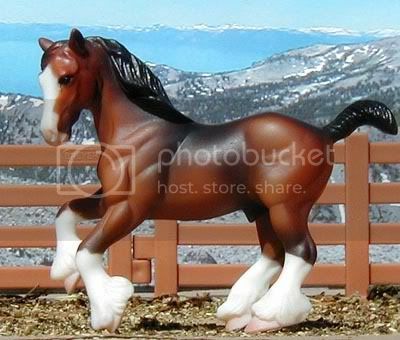 Model information: Breyer Clydesdale Mare mold; #825 Clydesdale Mare, produced 1990-1991. 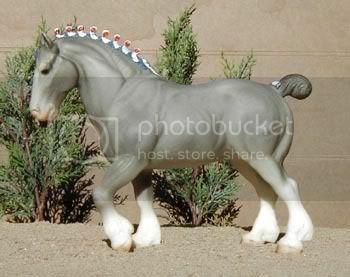 Model information: Schleich Clydesdale Foal mold; similar to Breyer Littlebit/Paddock Pal scale; current. Lines to Armageddon's Lord Jacob, Doura Masterstroke, Bardrill Glenord, Craigie Surmount, Torr's Benefactor, Bardrill Castle. Sire and dam have reserve championships. Awards: Live show placed, and has achieved Champion status with IMEHA. 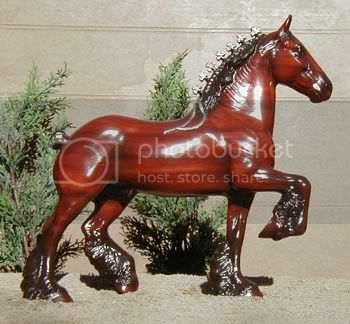 Model information: Stone Horses Trotting Draft mold; "Jingle Bell Rock" special run, non-custom glossy version; produced in 2005. Lines to multi-champion Dunelm Tartan. 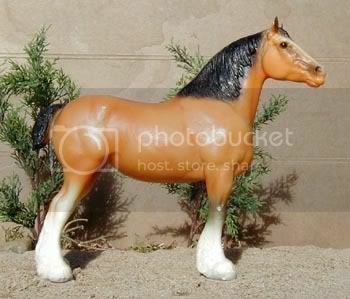 Model information: Breyer Clydesdale Mare mold; #83 Clydesdale Mare, produced 1969-1989, chalky version.